Travis Bower was born and raised in Alberta, fortunately to a rather outdoorsy family. Hunting, camping and fishing trips were common notes on the family calendar. Travis’s family is who he thanks the most for his love of the outdoors. Hunting was a major aspect of life to which Travis latched to, especially after his first harvest, a Bighorn ewe. At the age of 19 Travis first took to the valleys with traditional archery tackle in hand, taking a deer his first season. 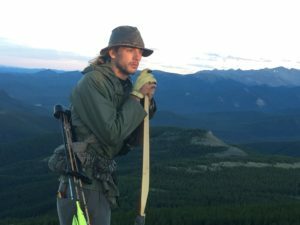 Shortly after getting into archery he did a 6 month season, living off grid in the Albertan foothills. During this time he dove into wilderness skills, especially foraging and eco-system understatement. After this first season in the woods, four more soon followed; in wall tents, lavvus and a winter in a cabin. Each season added onto the lessons of the last. On the last summer living under canvas Travis foraged food near every day to supplement his diet. His work life also aligned with connecting to the woods at this time. Working in native landscape and bio engineering gave more insight into wild food and the network to which they are a part of. During this time in the woods, archery always sank the deepest into Travis’s soul. Shooting became like meditation, a daily exercise in mental and physical discipline. Many days where spent stumping, putting arrows into stumps on the path ahead. Following the last arrow to the next, is how he navigated the woods. Since then Travis has become an efficient hunter. Bighorn Sheep and Moose have been his focus the past few seasons, with the sheep still eluding him on high mountain tops. His biggest joy though in archery is instruction. Three years ago Travis took over a kid’s archery program with 8 students, now hosting more than 30. He has given private lessons for 6 years around S.W. Alberta and has taken people out for their first hunts. His main goal through teaching is to guide people to what a bow and arrow means to them individually. No matter if the arrow is shot at a animal, target, a stump or shot in the pursuit of fun Travis believes everyone can find a use for the bow in their life.